With just over two weeks to go to the West Ham Players awards at the InterContinental London O2 we ask who you are likely to vote for as your signing of the season? The awards sponsored by Betway will be held on Wednesday 8th of May with individual packages costing £354 for a place at a table or £742 per person if you want to dine with Manuel Pellegrini on his table. West Ham legend Ronnie Boyce will be honoured with the Lifetime Achievement award at the 2018/19 Player. The Hammers splashed over £89.5m last summer but who is your signing of the season? Who is West Ham’s signing of the season? Michail Antonio was the Claret and Hugh man of the match when hundreds of hundreds of rating were compiled and averaged out for the weekend’s game against Leicester City. The Hammers goal scorer and carpet stroker scored an average of 7.55, the only West Ham player to score a 7 or above at the London Stadium on Saturday. Captain Mark Noble was the top of the sixes with a score of 6.75 followed by Arthur Maskuaku on 6.63, Fabianski was 6.61 closely followed by Robert Snodgrass on 6.6. Declan Rice found himself on 6.59 followed by Lucas Perez who managed a goal and scored a 6.56, Pablo Zabaleta was next on 6.46 followed by Angelo Ogbonna on 6.26. Fabian Balbuena got an average score of 6.14 followed by record signing Felipe Anderson on 6.12. Pedro Obiang was top of the fives with a score of 5.65 despite managing an assist while Marko Arnautovic came bottom of the ratings this week with an average score of 5.01. The results are in for the Kit design survey which will be shared with the club at tomorrow’s West Ham United Official Supporters’ Club (WHU-OSB) subgroup meeting at the London Stadium. 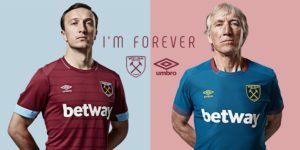 Almost 3,000 voted in the survey which will help design the Hammers kits for the 2020/2021 season. Question 1: With the home kit socks what colour do you prefer? Question 2: With an away kit, would you be happy with an unconventional colour as seen in recent seasons? Question 3: Do you prefer shirts with or without collar? Question 4: Should the home shirt have sky blue sleeves or just a sky blue trim? Question 5: What colour away kit do you prefer. White, navy, sky blue or other? Question 6: If the shirts were embroidered with a pattern what would you like to see? Question 7: Should the crest on the shirt match the colour of the shirt or be the standard design? Question 8: What era would you like to see potentially influence a new kit design? A key member of the Hammers youth set up is set to leave the club this month after being headhunted by New York City FC. Under 23 manager Liam Manning, , who only took over as boss from Terry Westley at the start of a season that could easily see the team relegated with the drop now out of their hands, is ready to quit the Hammers for the MLS outfit. It will come as a shock to the club and it is unclear who will replace Manning following an announcement of the move on FC New York’s official website. He will become director of coaching for the club which is currently sitting ninth in the 12 team league with eight points from seven games. It means he will take charge of his last under 23 game on the 27th of April against Everton with the team hoping to win with other results going their way to avoid them slipping out of Premier League 2 Division One. Reports that West Ham boss Manuel Pellegrini will have £30 million plus all monies brought in from player sales this summer are essentially correct. But should they need to, the Hammers are likely to set up a borrowing arrangement for whatever remains to be found for priority target Maxi Gomez should it turn out they have to meet the Celta Vigo €45 million buy out clause. There remain hopes that this could be reduced to €22 million should Vigo be relegated from La Liga but currently they sit three points of the drop zone although only three points separate them from 18th placed Real Vallidolid. CandH has learned the Hammers remain entirely centred on bringing Gomez to the club this summer three years ahead of his contract ending in Spain. Manuel Pellegrini is also keen to bring in another central defender, box to box midfielder and a back up striker as he gets to grips with the weaknesses in the squad. Luzaks Fabianski is set to waltz away with his second Player of the year award after lifting the honour at Swansea last season. The stopper has been in amazing form all season long and has been the favourite to lift the Hammer of the Year award this term for weeks. There are only two players in the frame with of course Declan being the other although frankly to call it a two horse race would do the word ‘race’ an injustice. It’s been many years since the club has had such a brilliant goalkeeper and it was inspired decision by somebody to bring him to the London Stadium. He has made more saves than any other Premier League keeper this campaign and whilst on the one hand that points to a big weakness in the team it should not detract from Fab’s amazing season. In a ClaretandHugh poll he collected 1207 votes from the 1,500 plus cast which represented 78.53pc of the vote with Declan picking up 311 votes (20.23 pc). West Ham are still hoping the Premier League will agree to a change of kick off time for the Hammers last home game of the season! The club are desperate to arrange it to help fans get to Wembley for the Womens Final against Manchester City and has its fingers crossed the Premier League will agree. However, ClaretandHugh can reveal that if the PL turn us down, the club will attempt to show the Wembley clash on the London Stadium screen. The stadium owners will have the final say on that and it may not be possible but should agreement be reached it would provide a nice farewell to the 2018/19 season at the stadium. A Hammers insider told CandH by e-mail: “We accept it will be a difficult and expensive task to get LS to keep the ground open. Manuel Pellegrini’s arrival at West Ham was welcomed as a major coup by a club determined to shake off the awful relegation threatening situations of previous years. A major managerial ‘face’ he was handed a £100m budget and hopes have been rarely been higher that the club was finally on its way to something big. However, Sir Trevor Brooking was among those who warned that the full three years of his contract would be required for the Hammers to fulfil the potential hoped for under him. And as the season has worn on with the club on 43 points and three games left there are some who will undoubtedly be reserving judgement on his first seasons. Claretandhugh decided to put to the vote whether the first campaign had lived up to the fans expectations and the result was surprisingly tight. The result came out as something of a cliff hanger with 54.36 per cent of those voting (748) happy and 628 (45.64 pc) disappointed. Jack Wilshere’s six minute cameo against Leicester City has been widely condemned on some forums as a reason why the Hammers were hauled back in injury time. Arriving for Mark Noble he had no time to impact on the game and the suggestion is that Mark Noble’s departure upset the balance of the team when we needed to hold on to what we had. It may or may not be a valid criticism but it certainly begs the question “why” and was an easy reason to latch onto for the loss of two points. But the bigger issue is whether the midfielder can ever truly make the sort of return to the game he wants and the Hammers require after signing on a free from Arsenal in the summer. It was a controversial decision in itself exacerbated by him being given a three year contract on £100k a week. The outcome doesn’t need to be mentioned but one pundit who has his doubts is another former Arsenal man, Ray Parlour. Speaking on talkSport “It’s been a really frustrating season for him again. Everyone thought, ‘well, he’s gone to West Ham and he can really establish himself in that midfield area’. “People are saying if he plays well he can knock on the door again for the England squad, but it’s been an absolute disaster for him again. Him and Andy Carroll are the ones who are always in that treatment room. “But he’ll be happy that he is back involved because it’s so frustrating when you’re out for long periods of time. The big worry now is what does his future hold? Robert Snodgrass’ West Ham season has been nothing short of astonishing given where he was at the beginning of the campaign. It’s been said many times before but from Hammers outcast to key midfielder who has made 38 appearances for the first team is a total tribute to the man. In any other season it might even have been enough to put him among the Hammer of the Year front runners but this time round Lukasz Fabianski and Declan Rice clearly lead thepack. Sadly Snoddy is currently caught up in. a row with the FA over the use of words he chose to adopt when confronted by FA doping officials making a routine visit to Rush Green. That certainly hasn’t affected his form as he continues to fight his case but he is deeply disappointed at some of the verdicts that have gone against the team generally this season and has become an advocate of VAR when it arrives next season. After those two controversial penalties at Old Trafford and an onside goal being declared off from Lucas Perez on Saturday it’s apparent that this can only help everybody’s cause. He told www.whufc.com: “This is probably why VAR is coming in because you see the Champions League where they get the decisions spot-on. It’s just opinions; some people say it’s good, some people say it’s bad, if it goes against you or if it doesn’t. It’s football. Sometimes you get it and a few weeks in a row it’s cost us. “We’re disappointed but you can clearly see the work-rate is a heck of a lot better than it was during the run we were on. “The manager was saying there are ways of getting beat and, as a team, I thought we were top-notch, especially in the first half and for large spells of the Man United game and the second half of the Chelsea game.